Athena. Art Gown by Resa McConaghy©2018. This is another post on the series of Tarot, featuring Resa McConaghy´s excellent gown “Athena”. To recapitulate: in previous posts, I have digged into Tarot: Major and Minor Arcana. Furthermore, in the last post, also written in collaboration with Resa, we´ve analyzed how certain Tarot cards somehow define “archetypes”, and could, therefore, be related to The Hero´s Journey and Mythology. In this new post, I´ll present Resa´s majestic gown “Athena”. Before that, I ´ll introduce some facts and information concerning Athena, the Greek Goddess of Wisdom. Then comes Resa´s gown. By then, we´ll see how some symbolic details she has chosen could be associated with Mythology, Tarot and Astrology. Finally, aside from Athena and to conclude, I wanted to spotlight some sketches that Resa did, based on Goddess Mnemosyne and Artemis. (Disclaimer: All gown and sketches photographs were taken by Resa and/or featured on her blog Art Gowns © Resa McConaghy. 2018). Athens – Pallas Athena Statue at Athens University. Athena (Roman equivalent: Minerva) was born from Zeus after he experienced an awful headache and she sprang fully grown and in armour from his forehead. She has no mother but one of the most commonly cited stories is that Zeus lay with Metis, the goddess of crafty thought and wisdom, and then swallowed her whole as he feared she will give birth to a child more powerful than him because of a prophecy… But Metis had already conceived. Athena was the Goddess of Wisdom and knowledge. Besides, she was the Goddess of War, the female counterpart of Ares. Athena’s moral and military superiority to Ares derived in part from the fact that she represented the intellectual and civilized side of war and the virtues of justice and skill, whereas Ares represented mere blood lust. Athena symbolizes the feminine content that is oriented toward the masculine and particularly helpful to it. Taken as an inner principle, an aspect of a man’s psyche, she represents the feminine figure of wisdom, “Sophia“. In fact, Athena gravitates toward men in power to learn from them, adopting them as mentors and partners on her own climb to success. She will go so far as to defend them against accusations of misogyny. Athena didn’t even often acknowledge the existence of her mother, Metis, as she was born from Zeus´ head. As for defending men, that’s basically what happened in the myth of Arachne. Arachne challenged Athena to a weaving contest, then she wove a brilliant tapestry that happened to depict Zeus as a promiscuous adulterer. Athena turned Arachne into a spider. Interestingly, she didn’t punish Arachne for challenging her to the contest, or for doing a great job. She punished Arachne for having depicted Zeus, Athena’s beloved, respected father, in a bad light. In the same direction, Jean Bolen feels Athena is very much a supporter of the social/political status quo, as evidenced by her vote to acquit Orestes in the murder of his mother Clytemnestra. Known for protecting civilized life, Athena was the Goddess of the City of Athens. Her most important festival was the Panathenaea, which was celebrated annually at Athens. She helped Perseus slay the Gorgon Medusa. Athena assisted Jason and the Argonauts build their ship before they set out to capture the golden fleece. She looked after Achilles during the Trojan War, and later aided Odysseus on his journey home. Athena was also a patron of the arts and crafts, especially when it came to spinning and weaving. In fact, there is a myth tells that she turned the weaver Arachne into a spider after the mortal woman insulted Athena and the Olympian gods. Athena was essentially urban and civilized, the antithesis in many respects of Artemis, goddess of wild animals, the hunt, and vegetation. She was usually portrayed wearing body armour and a helmet and carrying a shield and a lance. 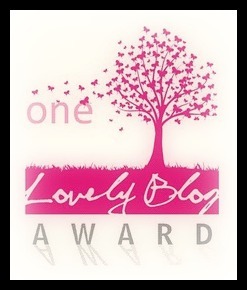 Besides, she was said to be the creator of the olive tree, the greatest blessing of Attica. She was associated with birds, particularly the owl, which became famous as the city’s own symbol, and with the snake. Jean Bolen groups Athena among the “Virgin Goddesses,” along with Artemis and Hestia. Bust of the “Velletri Pallas” type, copy after a votive statue of Kresilas in Athens (c. 425 BC). Marble Greek copy signed “Antiokhos”, a 1st-century BC variant of Phidias’ 5th-century Athena Promachos that stood on the Acropolis. Bronze statue of the goddess Athena known as “Athena of Piraeus” – Classical period, 4th century B.C. This gown is absolutely beautiful!. Athena, as a Graffiti Goddess is, in my opinion one of Resa´s most original and creative gown. Resa included many symbols from Tarot, Astrology and Mythology, which she painted on the fabric. As the paint had made the satin heavier and altered the drape, she added a petticoat. Resa is Leo!. The zodiac sign Leo is indicatese a Lion. While its glyph appears as the head and tail of a Lion, it also represents the Greek letter “lambda,” which is the first letter in the word “Leon,” meaning Lion. Leo´s element is fire. The respective date range: July 23 – August 22. The Tarot card for Leo in Major Arcana is Strength (VIII). 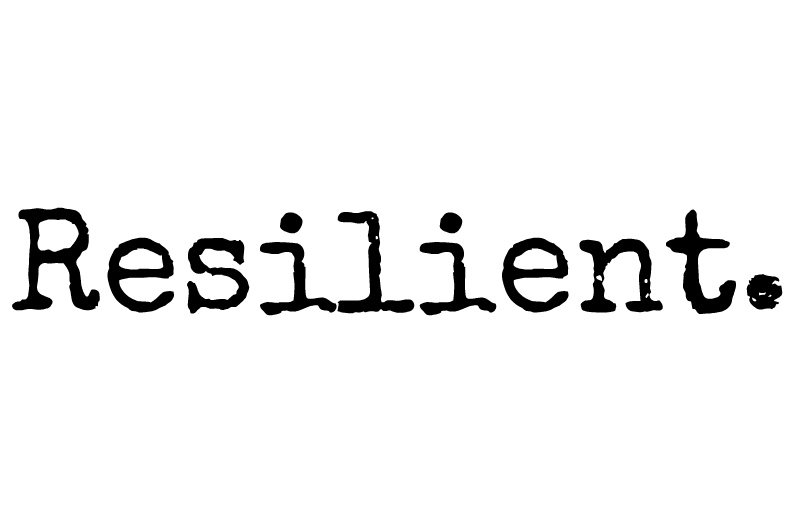 This card in the upright position means strength and power. Refusing to get angry, maintaining composure. Caring about others, compassion. Forgiveness. Persuasion, being able to influence. Libra was included because is a sign related to Justice, and hence to Athena, as a Goddess of wise counsel and civilization. The sign Libra is represented by the Scales. They represent the idea of balance and imbalance, and Libra is on a lifelong quest for perfect balance and moderation. Venus, the planet of love, casts her sensual powers of persuasion and charm on Libra. The zodiac sign Libra gets its firm mind and morals from the element of Air. Air is the element of intellect and clarity, and Libra leans on these strengths on her quest toward justice and equilibrium. The respective date range for Libra is: September 23 – October 22. The Tarot card for Libra in Major Arcana is Justice (XI). 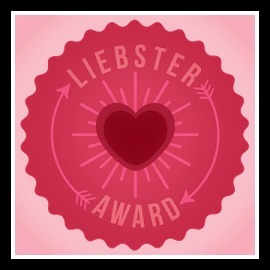 This card, in the upright position means: Fairness, justice. Honesty and responsibility. Acknowledging the truth and accepting the consequences of your actions. I am Scorpio. The zodiac sign Scorpio equals the Scorpion, and its glyph depicts the sharp stinger of the Scorpion in its pointed arrow. Much like Scorpio, the Scorpion’s natural weaponry allows it to survive and thrive alone in dark or uncomfortable situations. The planet Pluto harnesses its powerful and persuasive side as it rules over the zodiac sign Scorpio. The element of Water flows consistently and powerfully through the zodiac sign Scorpio. The date range for Scorpio is: October 23 – November 21. The Major Arcana card for Scorpio is the Death card (XIII ) This card emphasizes the sign’s connection to the transformative cycle of life. This Tarot card uses death in a figurative sense, representing endings of all forms. Scorpio utilizes this concept of impermanence to continually grow, often killing off the ventures, activities, or relationships in its life that no longer serve them to make room for something new. The symbol for the sign of Pisces reminds us of two scales and balance, features linked with Athena. The zodiac sign Pisces is embodied by two Fishes, and its glyph represents an image of these Fishes, linked together. They are a representation of Pisces’ ability to exist simultaneously in both a conscious and subconscious world. 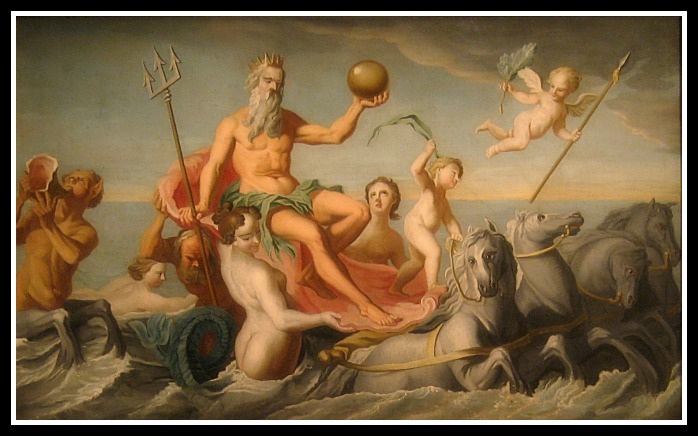 Neptune rules over the zodiac sign Pisces. The element of Water flows through Pisces as a wave of devoted empathy and intuition. The date range for Pisces is: February 19 – March 20. The Major Arcana card for Pisces is the Moon (XVIII). This card, in the upright position suggests illusion, fear, anxiety. It may entail deception and losing direction. Major Arcana XVIII: The Moon. Athena as a virgin, warrior Goddess is one of the most powerful Greek Goddesses. That´s why Resa chose this symbol, associated with Femininity with Goddess Venus/Aphrodite. Venus was the Roman equivalent of Aphrodite, the Goddess of Love. The symbol is often considered to represent a bronze mirror with a handle or a distaff. Eight (8) is the Number of the perfection, the infinity. In mathematics the symbol of the infinity is represented by a 8 laid down. It presumably evolved from the Etruscan numeral for 1000, which looked like this: CIƆ. There is another theory that he actually derived the infinity symbol from omega (ω), the last letter of the Greek alphabet. The ouroboros symbol, showing a snake twisted into a horizontal figure eight (8) and biting its own tail, is also said to be a most plausible basis for the infinity symbol because it is a fitting depiction of endlessness. Worth noting that the snake was one of the mos important symbols associated with Athena. The snake’s well-known ability to shed its skin and emerge, apparently reborn, gave rise to an association with rebirth, hence with Athena. The Star Symbolizes: Inspiration, Imagination, Wonder, Dreams, Pursuits, Magic (, Creative Brilliance, and Divine Guidance. These traits are characteristic of Goddess Athena. In Major Arcana, card XVII is precisely The Star. This card is related to the astrological sign of Aquarius. It entails illumination, guidance and renewal and suggests nourishment and hope. These two Queens could be linked to Athena, as far as determination, strength, rationality and independence are concerned. ⇒Queens of Wands: This card in the upright position means: Exuberance, warmth, vibrancy, determination. Description of the card: The Queen sits upon her throne that is decorated with lions facing opposing direction, a symbol of fire and strength. In her left hand and behind her are sunflowers, symbolising life, fertility, joy and satisfaction. In her right hand is a wand which is beginning to blossom with life. In these positive aspects, the Queen of Wands represents fidelity, warmth, and sustenance. 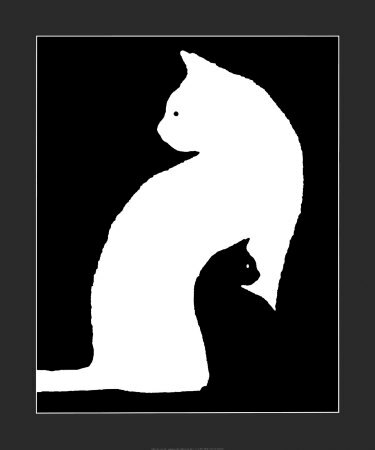 However, at her feet is a black cat, a symbol of the darker, lesser known side of this Queen. Black cats are typically associated with magic and occultism. ⇒Queen of Swords: This Minor Arcana card in the upright position means: Quick thinker, organised, perceptive, independent. Description of the card: The Queen of Swords sits high on her throne. In her right hand, she holds a sword pointed to the sky, and her left hand extends as if she has something to offer to others. The sky is clear, representing her clarity of mind as she considers matters of the intellect. The bird above her head symbolises the mind’s ability to soar above daily issues in order to arrive at appropriate solutions. Queen of Wands and Queen of Swords. Minor Arcana: Queen of Wands. Minor Arcana: Queen of Swords. In Tarot, this is a card of Victory, that can not go unnoticed if we think of Athena. This Minor Arcana card in the upright position means: Gratitude, luxury, self-sufficiency, culmination. Description of the card: The Nine of Pentacles shows a woman walking in the midst of a vineyard. A falcon sits calmly on her left hand. Far in the background is a large house, presumably belonging to the woman herself. There is a general sense of peace, satisfaction, and the fulfilment of a creative venture or personal investment as the result of one’s own efforts. Minor Arcana: Nine of Pentacles. Athena Held owls as sacred. In Ancient Greece, owls were associated with wisdom, intuition and prophecy. As a spirit animal, the owl guides us to see beyond the veil of deception and illusion; it helps see what’s kept hidden. It is a strong spirit guide for discernment and making decision based solid foundations. The third eye is a mystical and esoteric concept of an invisible eye which provides perception beyond ordinary sigh. The third eye is often associated with religious visions, clairvoyance, the ability to observe auras, premonition, and out-of-body experiences. These traits are clearly related to Goddess Athena. In ancient Egypt, the all-seeing eye was known as the Eye of Horus or the Eye of Ra. Through various myths they were symbols of protection, healing and restoration. According to the hindi tradition, The third eye chakra is the sixth chakra, also known as the eye of Shiva. Located on the forehead, between the eyebrows, it is the center of intuition and foresight. The function of the third eye chakra is driven by the principle of openness and imagination. 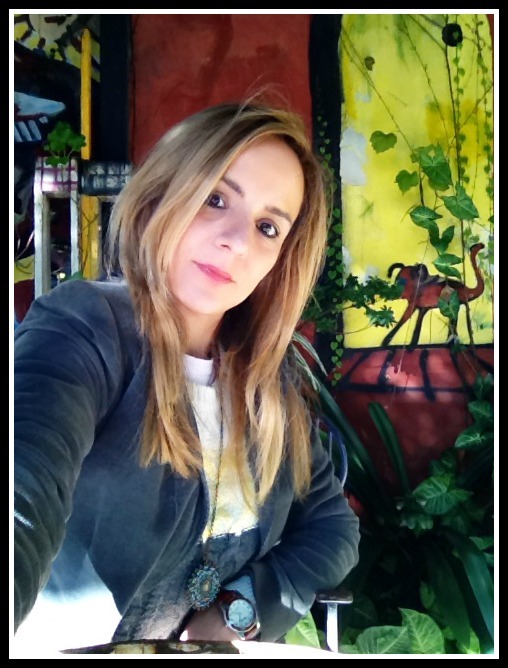 Make sure to follow Resa´s blogs: Graffiti Lux and Murals and Art Gowns. As Resa and I found some graffitis which seemed to have mythological and even philosophical equivalents we decided we wanted to try to show those connections. Resa´s mural is from the University of Toronto (Toronto, Canada) whilst mine are from The Planetarium (Palermo, Buenos Aires, Argentina). With that being said, we just wanted to say that, after finding many similarities, we are quite pleased with the outcome. Both of, Resa and I believe the convergences are striking. And being so, they broaden and deepen the value of the immortal Ancient Greek Legacy. The Galileo Galilei planetarium, commonly known as Planetario, is located in Parque Tres de Febrero in the Palermo district of Buenos Aires, Argentina. The building was officially opened to the public on April 5, 1968. It consists of a cylindrical framework with independent projectors for the Moon, the Sun and the visible planets (Mercury, Venus, Mars, Jupiter and Saturn) and two spheres in the extremes that project 8,900 stars, constellations and nebulas. Nowadays the Planetarium is surrounded by a thin sheet metal with many murals on it. We´ll present here some of them, aiming to find mythological and philosophical corollaries. This graffiti is quite the finding. It is based on an original painting “The abduction of Psyche” by William-Adolphe Bouguereau (1894). The artist included a Planetarium above the couple. According to the greek myth Aphrodite was jealous due to men’s admiration for Psyche, so she asked her son, Eros, to poison men’ souls in order to kill off their desire for Psyche. But Eros fell in love with Psyche. Thus, against his mother´s wishes, he asked the west wind, Zephyr, to waft her to his palace. This mural with goat head and human hands might remind us of the constellation Capricornus . Its name is Latin for “horned goat” or “goat horn” or “having horns like a goat’s”. This constellation protected by Hestia, represents Pan, the god of the wild and shepherds. 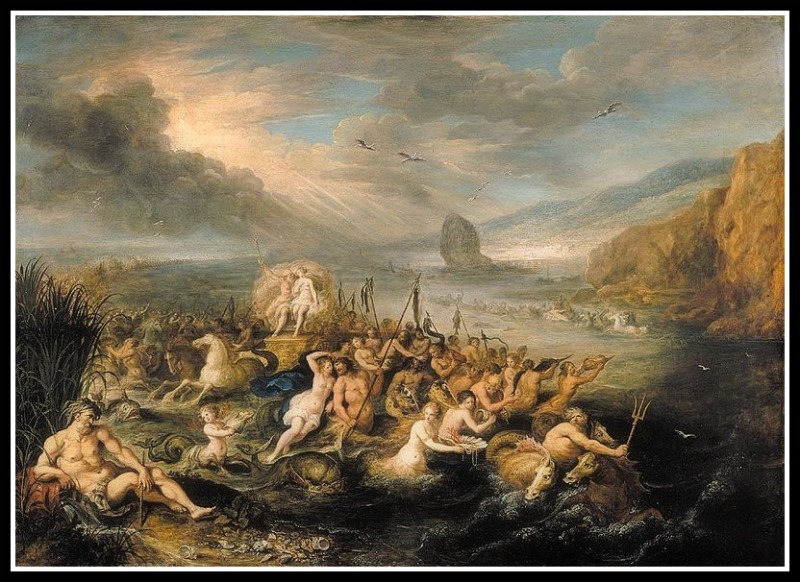 The myth tells us that, in order to escape Typhon, Pan cast himself into the river, making the lower part of his body look like a fish, and the rest a goat: Zeus, admiring his shrewdness, put this shape among the constellations . However, in this mural, we lack of the sea elements… But the resemblance between hands and fins couldn´t go unnoticed, either way. This mural seem to evoke the Great Greek Bull. It could be linked to the Minotaur. According to the respective myth, after Pasiphae (the daughter of Helios, the Sun, by the eldest of the Oceanids Perse) become impregnated by a white bull, she gave birth to a sort of hybrid child, the bull-headed Minotaur. Angered with his wife, Minos imprisoned the minotaur in the labyrinth of Crete in Knossos. Presumably, Minos was one of the three sons from the union of Europa and Zeus; when Zeus was in the form of a bull. As to snakes, let´s remember the rod of Asclepius, God of Medicine and Apollo´s son. It symbolizes the healing arts by combining the serpent, which in shedding its skin is a symbol of rebirth and fertility. The Asclepius Wand, often confused with the Caduceus wand of Hermes, is the symbol of the medical profession. Cultic snake belonging to the god of healing Asclepius. Statue of Asclepius with snake. 250 BC. Pasiphae, the Mother of the Minotaur. The words on this mural mean: Time. But what is exactly time. St Augustine of Hippo says in his “Confessions”: “What then is time? If no one asks me, I know what it is. If I wish to explain it to him who asks, I do not know”… Time is such an elusive concept, indeed!. In Greek mythology, Chronos was the personification of time, not to be confused with Cronus, the Titan and father of Zeus. The Greeks had two different words for time: Chronos refers to numeric or chronological time, while another word kairos refers to the more qualitative concept of the right or opportune moment. The figure of Chronos was typically portrayed as a wise old man with a long grey beard: Father Time. Furthermore, the Horae or Hours were the goddesses of the seasons and the natural flow of time, generally portrayed as personifications of nature in its different seasonal aspects, and with the cycle of the seasons themselves symbolically described as the dance of the Horae. Detail of an attic vase, depicting the Three Horae (Seasons). Period: Late Archaic (500 BC). “Apollo and the Hours” by Georg Friedrich Kersting (1822). “Chronos and his child” by Giovanni F. Romanelli, a 17th century depiction of Titan Cronus as “Father Time”. Father Time and Baby New Year from Frolic & Fun, 1897. This mural is certainly esoteric. The eyes, placed in circular shape, surround the central number eight (8). Eight (8) is the Number of the perfection, the infinity. In mathematics the symbol of the infinity is represented by a 8 laid down. The Pythagoreans believed that number 8 was the symbol of love and friendship, prudence and rational thinking. . It was the Pythagoreans who held that there are in man eight organs of knowledge; sense, fantasy, art, opinion, prudence, science, wisdom, and mind. The person who actually introduced the infinity symbol was John Wallis, in 1655. This symbol is sometimes called the Lemniscate. It presumably evolved from the Etruscan numeral for 1000, which looked like this: CIƆ. There is another theory that he actually derived the infinity symbol from omega (ω), the last letter of the Greek alphabet. The ouroboros symbol, showing a a snake twisted into a horizontal figure eight (8) and biting its own tail, is also said to be a most plausible basis for the infinity symbol because it is a fitting depiction of endlessness. As to the eyes in this mural, we could think of the Eye of Providence Symbol (which appears in the USA dollar bill). It represents the eye of God, the singular divine power that has created the entire universe. The eye is most times enclosed in a triangle. At times, the Eye is also depicted as surrounded by clouds or bursts of light. Both of these images are representative of holiness and divine glory and so, here too, the symbol signifies that the Almighty is keeping a watchful eye on His creation. The Eye of Providence Symbol. The University of Toronto is a public research university in Toronto, Ontario, Canada on the grounds that surround Queen’s Park. It was founded by royal charter in 1827 as King’s College. It comprises twelve colleges, each with substantial autonomy on financial and institutional affairs. The mural in question is in an underpass that runs from Hart House Circle under Queen’s Park Crescent West to Wellesley Street. Resa came across this mural as she walked under Queen’s Park Crescent. She went by Hart House and exited using the King’s Park Circle. In the slide show below you can see some photographs of the location and buildings. The mural comes soon after!. (Disclaimer: All murals photographs and photographs from University of Toronto were taken by Resa and featured on her blog Graffiti Lux and Murals. © Resa McConaghy. 2017). 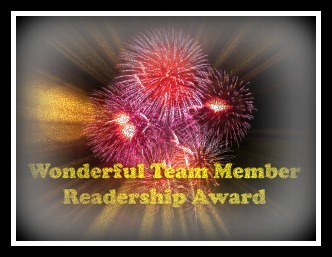 Please check out Resa´s post regarding this collaboration here. This graffiti could be linked to the Werewolf Man-wolf, or Lycanthropeis. Meaning, a mythological human with the ability to shapeshift into a wolf, either purposely or after being placed under a curse or affliction. A few references to men changing into wolves are found in Ancient Greek literature and mythology. For instance, Herodotus, wrote that the Neuri, a tribe he places to the north-east of Scythia, were all transformed into wolves once every year for several days, and then changed back to their human shape. Furthermore, we have the story of Damarchus. He was a victorious Olympic boxer from Parrhasia (Arcadia) who is said to have changed his shape into that of a wolf at the festival of Lycaea, only to become a man again after ten years. The festival of Lycaea involved human sacrifice to Zeus. A young boy was killed and then consumed by one of the participants, in this case by Damarchus, and as a result Zeus would transform the cannibal into a wolf. On the Left: A man wearing a wolf-skin. Attic red-figure vase, c. 460 BC. On the Right: Zeus turning Lycaon into a wolf, engraving by Hendrik Goltzius. 16th century. Following the hindu mythology pattern, according to which goddesses have many hands, we could conclude that having more than two hands is a mark of Divinity. Humans have two arms, so someone with multiple becomes special and out of the league. More hands at times also represents more strength.The multiplicity of hands also emphasizes the power and ability to perform several acts at the same time. As to number three, it represents the Holy Trinity. From a philosophical perspective, number three is symbolic of the reconciliation of opposites, as with Hegel‘s dialectic: “thesis + antithesis = synthesis”. Besides, it is both a lunar and a solar number. The moon has three major phases – the two crescents and the full moon, while the sun has three primary points in its existence: the low winter solstice; the high summer solstice, and the two equinoxes of March and September. The Kholkikos Drakon or (Colchian Dragon) was the ever awake serpent that guarded the Golden Fleece in a grove sacred to Ares in Kolkhis. When the Argonauts came to aquire the Fleece, they had to get past it. There are two theories as towards how they past the Drakon, either Medea put the monster to sleep so Jason could grab the fleece while it slumbered or Jason slew it. There is also a belief that the monster swallowed Jason and then regurgitated him thanks to the power of Medea, so that Jason could then slay the beast. Different cultural traditions have portrayed dragons with reptilian or serpentine traits so that it may seem to resemble cobras, crocodiles or lizards. The word ‘dragon’ traces its origin in the Greek word ‘drakon’ that means a huge serpent or a giant sea fish. Before Artemis became goddess of the moon, the Titaness Selene owned the Moon chariot, which she drove across the sky at night. Soon after, Artemis was the legatee of the carriage. 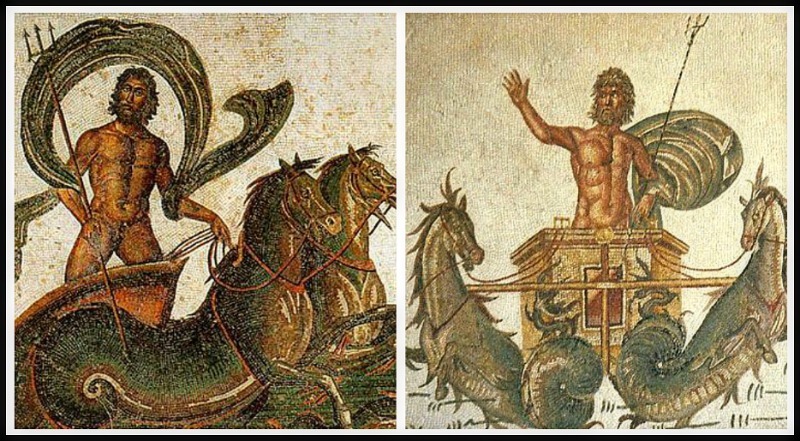 In the same way, Apollo received the Chariot of the Sun, once Helios became identified with him. Helios (Apollo), the Sun god, drives his chariot across the sky each day while Selene (Artemis) is also said to drive across the heavens. And, while the sun chariot has four horses, Selene´s (Artemis´) usually has two, described as “snow-white” by Ovid. As to the horse symbolism, it is often known as a solar symbol. Sometimes, horses are related to the sun, moon, and water. It acts as the mediator between Earth and Heaven. Horse symbolizes power, grace, beauty, nobility, strength, and freedom. The woman looking at Apollo (former Helios) could be his twin sister, Artemis (Former Selene). Artemis was the Goddess of Hunting and of Goddess of the Moon. In classical times, Selene was often identified with Artemis, much as her brother, Helios, was identified with Apollo. Both Selene and Artemis were also associated with Hecate, and all three were regarded as Lunar Goddesses, although only Selene was considered a personification of the moon itself. 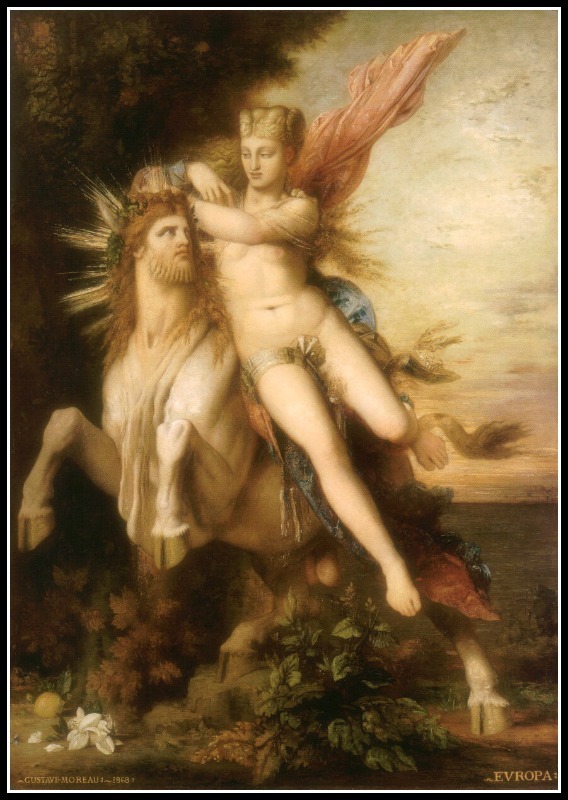 “Jupiter and Europe” by Gustave Moreau (1868). Zeus was the supreme god in Ancient Greece, the father of the Olympian gods and the ruler of mankind. He was identified with the Roman god Jupiter and associated with other deities, such as the Egyptian god Ammon and the Etruscan god Tinia. He was regarded by the Greeks as the god of all natural phenomena on the sky; the personification of the laws of nature; the ruler of the state; and finally, the father of gods and men. 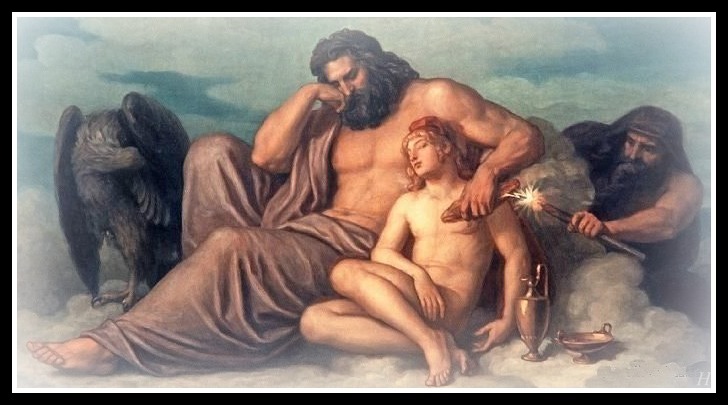 Zeus was the last child of the Titans Cronus and Rhea. Zeus had five older siblings. Two brothers (Poseidon and Hades), and three sisters (Hestia, Hera and Demeter). Cronus had learnt that he was destined to be overthrown by his son as he had previously overthrown Uranus, his own father. His wife Rhea, knew that he would kill the baby so she sought Gaia to devise a plan to save him. Finally, Rhea she gave birth to Zeus in Crete and hid him in a cave and he was raised by Gaia. As mentioned previously, Zeus’ father, Cronus, had sired several five children by Rhea, but he swallowed them all as soon as they were born. 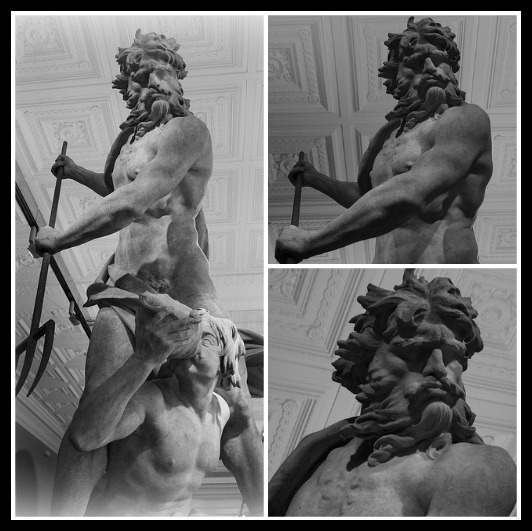 After reaching manhood, Zeus forced Cronus to disgorge his siblings in reverse order of swallowing. Then he released the brothers of Cronus, the Gigantes, the Hecatonchires and the Cyclopes, from their dungeon in Tartarus. 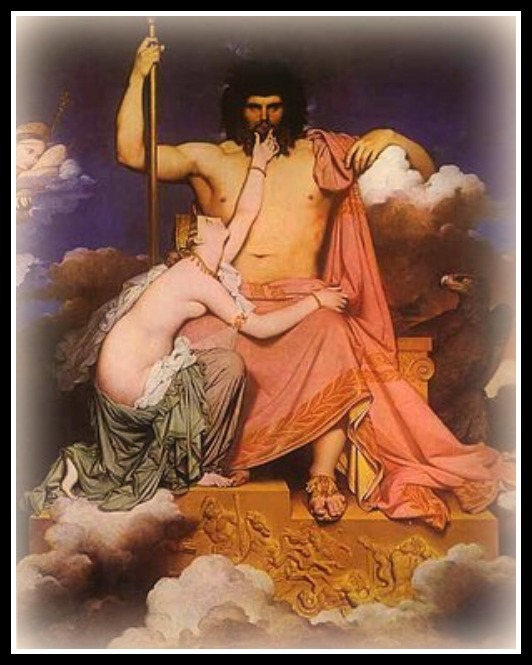 Zeus married his own sister, Hera, the goddess of marriage and monogamy, but was giving her plenty of reasons to be jealous, since Zeus was renowned of his numerous lovers As a result, Zeus fathered plenty of children. By Hera, Zeus sired Ares and Hephaestus (who would be both Aphrodite’s lovers) and Hebe, the goddess of youth. He had love affairs with Demeter (the Goddess of the Harvest and Perspehone’s mother), Leto (the Goddess of Motherhood), Dione (the personification of a more ancient Mother Goddess), Maia (a Nymph) and Thetis (A Sea Nymph and leader of the Fifty Nereids). Also Metis, (one of the Okeanides and the Titan goddess of good counsel and advise) was his lover and his first wife and Athena (the goddess of wisdom) was their daughter. Among mortals she had several lovers such as Io, Leda, Europa, and even the handsome young man Ganymede, to whom Zeus granted him eternal youth and immortality. Seleme was also among them and with her Zeus sired Dionysus (The god of Wine). Zeus was the god of regulated time as marked by the changing seasons and the regular succession of day and night, in contrast to what his father Cronus represented before him; absolute time, meaning eternity. As the personification of the operations of nature, he represented the glaws of unchanging order, by which both the natural and the spiritual world were governed. As the father of the gods, Zeus ascertained that each deity perform their individual duty, punished their misdeeds, settled their disputes, and acted towards them on all occasions. 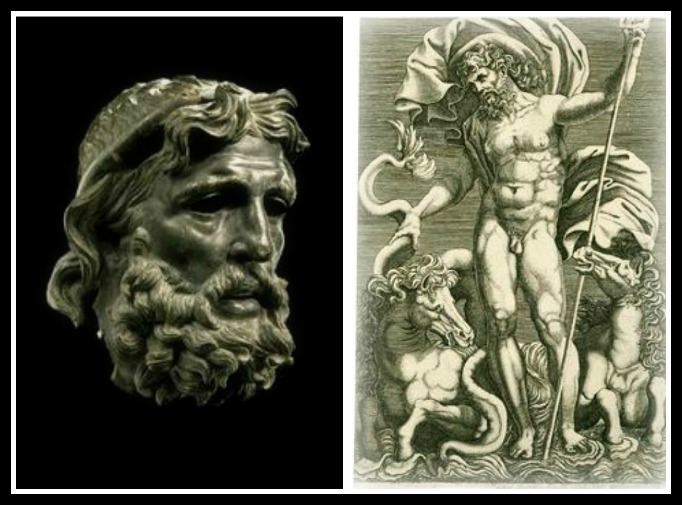 The symbols of Zeus were the scepter, the throne and the thunderbolt, which was as a gift from the Cyclopes after he liberated them. Zeus’ tree was theoak tree and his sacred animal was the eagle. Using his shield, the Aegis, he could create all natural phenomena related to the air and the sky, such as storms and tempests. 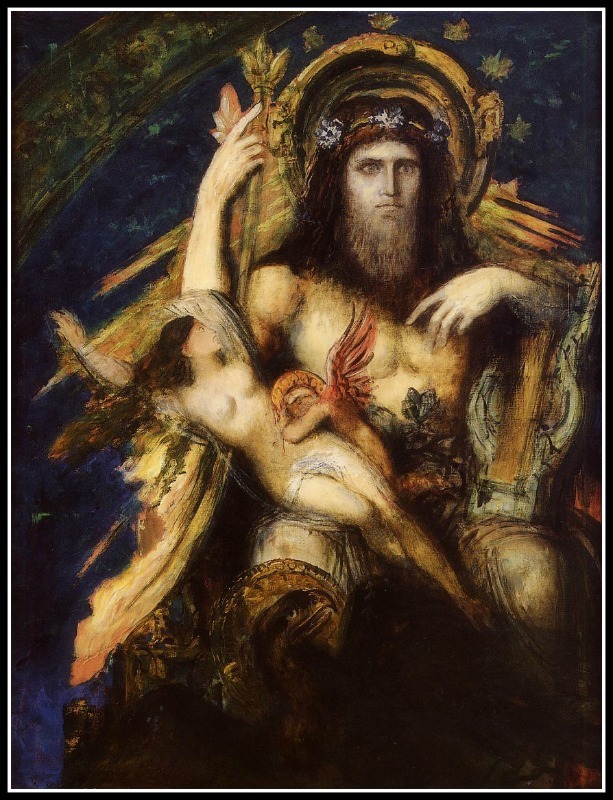 “Jupiter and Semele” by Gustave Moreau (1895). 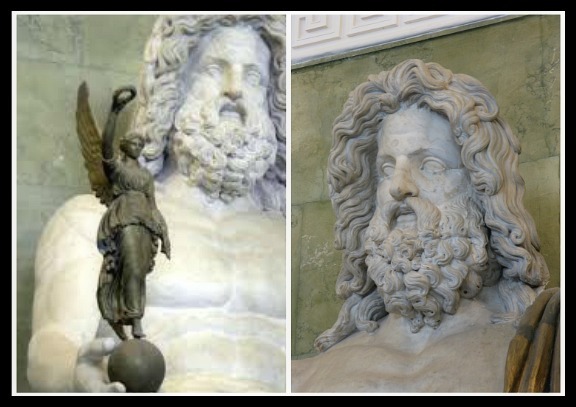 “Zeus and Ganymede. (Ttheft of fire)” by Christian Griepenkerl (1878) . “Jupiter and Thetis”, by Jean Auguste Dominique Ingres. (1811). “Zeus at Olympia”, sculture by Phidias. Drawings. 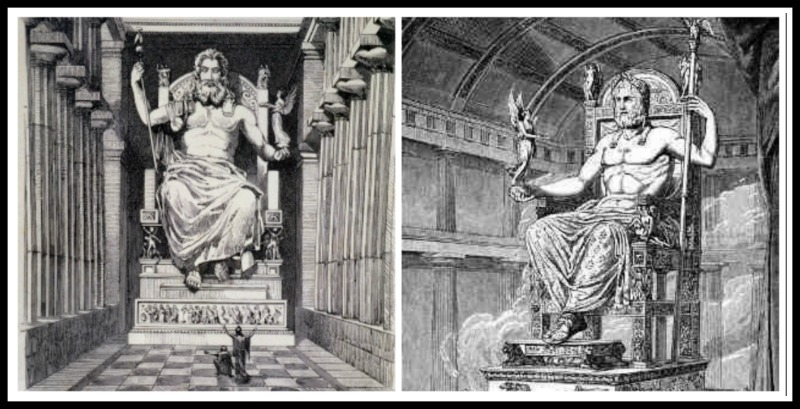 On the Left: A fanciful reconstruction of Phidias’ statue of Zeus, in an engraving made by Philippe Galle in 1572. On the Right: Coin from Elis district, Greece illustrating the Olympian Zeus statue. The Statue of “Zeus at Olympia” was a giant seated figure, about 42 ft (13 m) tall, made by the Greek sculptor Phidias around 435 BC at the sanctuary of Olympia, Greece, and erected in the Temple of Zeus. It It was regarded as one of the Seven Wonders of the Ancient World, until its eventual destruction for unknown causes during the 5th century AD. In the 2nd century AD, the geographer Pausanias gave a detailed description. The statue was crowned with a sculpted wreath of olive sprays. It had gold sandals, and a golden robe carved with animals and lilies. In its right hand was a small chryselephantine statue of crowned Nike, goddess of victory. Its left hand held a sceptre inlaid with many metals, supporting an eagle. The throne was decorated in gold, precious stones, ebony, and ivory. 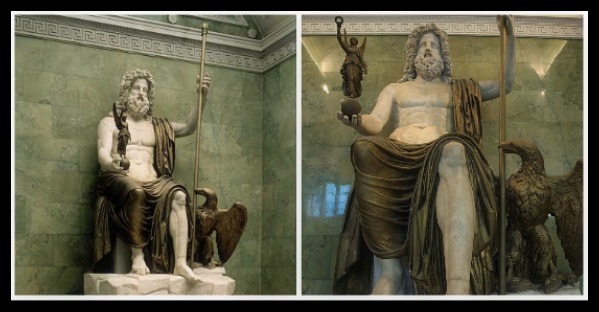 The Roman “Seated Zeus” sculpture is considered a copy of the original Statue of Zeus, and it was created following the type established by Phidias. “Zeus at Olympia”. Zeus enthroned holding a royal sceptre and winged Nike (Victory), and with an eagle by his side. Roman copy inspired by Greek ivory and gold statue of Zeus at Olympia by Phidias. Marble & Bronze . Imperial Roman. C1st AD Hermitage Museum, St Petersburg, Russia. “Zeus at Olympia”. Roman copy inspired by Greek ivory and gold statue of Zeus at Olympia by Phidias. Marble & Bronze . Imperial Roman. C1st AD Hermitage Museum, St Petersburg, Russia. 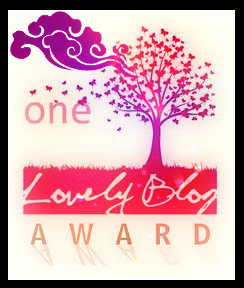 I would like to thank Purple Anais from Arwenaragornstar for nominating me for a Lovely Blog Award. 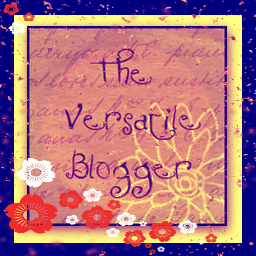 I also want to thank The Chaos Realm for nominating me for a Versatile Blogger Award. 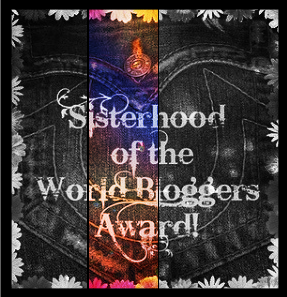 Finally I appreciate that Unbolt nominated me for a Sisterhood of the World Bloggers Award.